This entry was posted on Tuesday, August 23rd, 2011 at 20:15 and is filed under Barack Obama, Economics, Election 2012, Politics, Sarah Palin. First let me thank you for the blog. You have excellent insight into 'inside baseball' with respect to Sarah's run for the presidency. Second – I just had a thought. Just one – I don't want to overtax my brain. 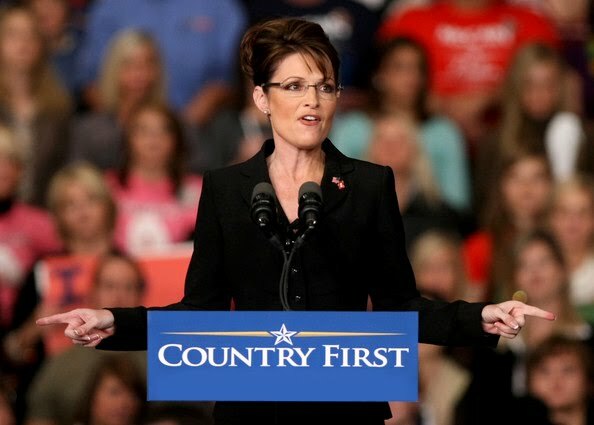 It always was rattling around in the back of my brain, but finally gelled – When Sarah was giving her acceptance speech for the VP position in 2008, the teleprompter screwed up and went too fast. Even at the time it seemed a bit weird to me – wasn't anyone running it at the time – THAT would be really stupid, especially considering the fact that there would be plenty of applause stoppages of unknown length, and this was a very important speech. So there must have been someone in charge of running it. So why was it allowed to run ahead? Did the person running it slack off? Were they not paying attention? Or did they do it purposely? I'm starting to wonder if it was done purposely, by some RINO, establishment ruling class, entrenched political class muckup that wanted to make Palin, and perhaps, McCain look bad. I really can't see any other sensible explanation for what happened. Especially after reading "Going Rogue", and seeing the way she was treated after the election by many republicans in the campaign. What do you think? Thank you for reading my blog! I've never known what to make of the situation with the Teleprompter that night. I also know technology isn't foolproof. Whether some person had a hand in it, I cannot say, but I do know that technology does fail, or hesitate, or glitch, so I'm not sure. Why do so many people love to hate her? No other potential candidate has been treated the same. The so called experts are counting her out and saying that if she does enter the race that she would cause more harm by splintering the votes. Have been to some other sites and they just spew hatred and disrespect. To disagree is one thing, to hate is another. I hope she proves them all wrong. Well, understand that most of these haters already know who their candidate will be(Obama) and those on the right are being driven by the RINO intelligentsia. Don't sweat them just yet.